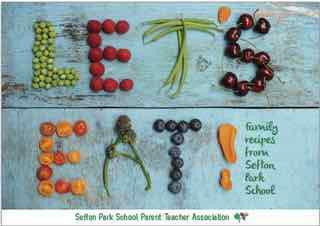 Earlier this year, the Sefton Park School PTA launched a new 155-page Recipe Book, Let's Eat, to help raise funds for the benefit of all children across the Infant and Junior Schools. Packed with 79 easy-to-cook recipes to help with everyday mealtimes, chapters include: Festival Food; Spontaneous Playdates; Double -Ups (where you can add an ingredient or two to transform a kids tea into a grown-up’s supper); Cooking with kids; Cake Sales; and World On a Plate. The Recipe Book features in an article in the latest edition of Bishopston Matters, describing how the combined efforts of Sefton Park parents, children, and local businesses led to the creation of this user-friendly, colourful book. Click here to read the full article on Page 5 of the December 2015 edition of Bishopston Matters.